This is what I use to pressure bleed the hydraulics. A 4 litre Nalgene polyethylene bottle with a presta valve in shoulder and a bulkhead fitting in cap. Other end of tubing connects to bulkhead fitting attached to an old brake reservoir cap. The 4 litre bottle is pressurized to about 7 psi with bike pump. You do have to top up reservoir every so often when bleeding, but its not much of a chore. 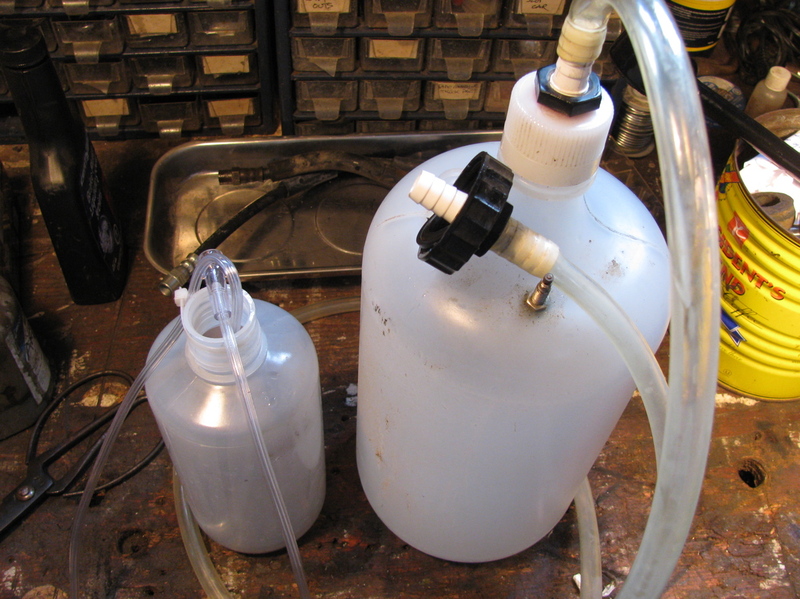 The 1 litre bottle collects the bled fluid. This entry was posted on February 9, 2011, 2:25 pm and is filed under vanagon, vanagon mods. You can follow any responses to this entry through RSS 2.0. You can leave a response, or trackback from your own site.